Things take a turn for the worse when Kai, Irene's dragon assistant is kidnapped. Irene must now risk travel into a world filled with chaos to save him and somehow in the process avert a war. With no allies to count on and a very real fear of breaking her vows to the Library, Irene sets off on her rescue mission. Successfully rescuing Kai could just mean her banishment but failing to succeed could very well be the start of the war that the fae were hoping to provoke when they kidnapped Kai. No matter which way Irene turns, the only thing that is certain is that her options aren't good. 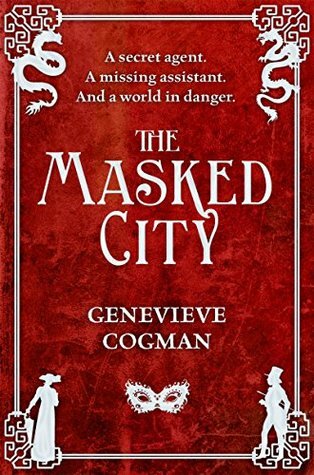 I was very hesitant to pick up The Masked City given my dislike of The Invisible Library, the first book in this series. I'm happy to report that I enjoyed this second offering much more. With the world well established in the first book, Cogman could simply get down to telling the story and this time, she did so without repeatedly telling us about the setting itself. This allowed me to get caught up with the story and get to know the characters at long last. As a protagonist Irene is always willing to consider all of her options, even when no good one presents itself. Even when things seem at their darkest she doesn't ever give up. It's her tenacity that wins the day and a facet of her character I found myself liking a lot. Irene even questions herself, which allows her to stop from falling under the control of the fae, whose glamour and power are quite capable of taking over her will. In The Invisible Library, Cogman's continual reference to the language, really bothered me. It was a concept that didn't make sense and felt like a writers device. I think this changed for the positive in The Masked City. As a reader, I came to see the language as a powerful tool at Irene's disposal and because Cogman created clear boundaries when it could and could not be used, it didn't feel like a device she employed to get out of each and every scrape. I very much enjoy the idea that one must be careful because words have meaning. As great as Irene is, she is yet another protagonist who is isolated. She has no female contemporaries and all of her companions and a large percentage of her enemies are male. It's almost as though no other woman can be great or even equal in Irene's presence. The relative isolation of women really does come down to a trope in this genre and I hope in succeeding novels to see Irene interacting more with women or even gaining a female friend. Because Kai spent most of this novel in captivity, we didn't really see a lot of him. That being said, we did learn that Kai is Asian and so his family. This isn't something that really wasn't confirmed in the first book and so it greatly increases representation in terms of POC in this series. I do however wish that there had been more obvious clues as to Kai's racial make up or references to his culture beyond his identity as a dragon. There's also Atrox Ferox, who is an Asian Fae. His role in the story is not large and quite like Kai, beyond being told that he's Asian, there are no markers in the story regarding his culture. It's as though being magical in some way blocked out connections between language, and cultural practices. What remained were the driven supernatural personas. There were two characters who may or may not be LGBT. Li Ming is referred to using both male and female pronouns. Irene is quite open about not knowing what gender Li Ming is and actually speculates. Li Ming could be gender non conforming or gender queer. Li Ming could actually be a lot of things but because Cogman has written hir so ambiguously and Irene has not thought to simply ask Li Ming what pronoun ze prefers it's a mystery for now. At this point however, I don't know how much presence Li Ming will have going forward since ze works for the dragons. Zayanna is also a fae and as part of her story (read:power) she wants the opportunity to seduce a hero. It's clear that Zayanna has no preference on the gender of said hero and so this leads me to believe that she is a bisexual character. Cogman was very brief with this part of the story so don't get excited about real inclusion folks. The Masked City is fast paced and action packed. I'm not one for long drawn out fight scenes and so I'm happy to say though there is lots of confrontation, there aren't any long battle scenes. I did find myself irritated by the Perry Mason like confessions of the antagonists. Just because they have the protagonist trapped doesn't mean a villain should suddenly feel safe to reveal all of their plans. Certainly, Irene needed some clue as to where to continue her search for Kai but it could have been handled more elegantly than it was. It amounts however to a small fault in an otherwise gripping tale. For the first time in this series, I found myself actively rooting for Irene to win. I wanted to see her outsmart her enemies. I love the change in gender dynamics in that it is Kai, the powerful male dragon who needs to be saved by the female human librarian. Kai may have brawn on his side but Irene has the brains and clearly that counts for a lot in this world. Not only is Irene whip smart, she's not afraid to get her hands dirty if she has to, though it seems far from her first choice. Unfortunately, this book cannot be read without first suffering through The Invisible Library because the world is so large and the concept of the language is unique. That being said, grin and bear the Invisible Library because The Masked City will be your reward.